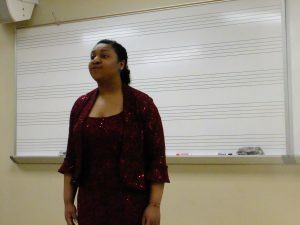 The Opera Guild of Dayton held the 2019 High School Vocal Competition on Saturday, March 23, at the Fitz Center at the University of Dayton. This is always an exciting annual event featuring vocal talent and providing monetary awards for the best performances. Dr. David Sievers of the University of Dayton acted as chair for the Competition. The winner of this year’s Competition is soprano Amy Helms, a senior from Kings High School in Maineville, Ohio. Baritone David Lewis picked up second place honors and soprano Trinity Hines-Anthony was the third place winner. Both David and Trinity attend Stivers School for the Arts. Honorable Mention goes to lyric soprano Elyse Schmidt from Beavercreek High School and soprano Olivia Helman from Granville High School. Congratulations to all. The judges for this year’s Competition were: Andrea Chenoweth Wells, University of Dayton; Linda Snyder, emeritus University of Dayton; and Jamie Cordes, Wright State University. Dr. Sievers and the judges are members of the National Association of Teachers of Singing, which celebrated the 75th anniversary of its founding on the day of the Competition. Funding for the prize money awarded for the Competition came from the Norma J. Ross Foundation. 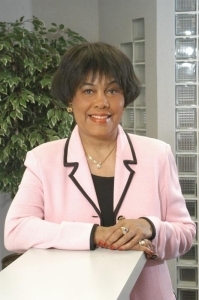 THANK YOU to the Norma J. Ross Foundation, which donated the monetary awards for the winner. THANK YOU to the Opera Guild members who volunteered their services today: Judy Hudson, Nora Stang, and Suzanne and Patrick Crippen. THANK YOU to the University of Dayton Department of Music and its chair, Dr. Julia Randel, for providing support and the venue. THANK YOU to our adjudicators: Dr. Andrea Chenoweth Wells from the University of Dayton; Jamie Cordes from Wright State University; and Dr. Linda June Snyder, Past-President of the National Association of Teachers of Singing, which, coincidentally celebrated the 75th anniversary of its founding today. THANK YOU to our staff pianists, Dr. Andrea Arese-Elias, John Benjamin, and Kathy Reichenberger. THANK YOU to our University of Dayton student volunteers: Mariah Berryman, Mary Catherine Donovan, Megan Green, Jillian Mitchell, and Blaise Stephens. THANK YOU to all the teachers, pianists and parents of the singers for all your support. THANK YOU to all the singers. You all did an amazing job! • Performance of two memorized selections. Selections may come from operatic, art song or musical theater literature. Please contact the chair, Dr. David Sievers, at dsievers1@udayton.edu for any questions regarding repertoire. Students in the 11th or 12th grades in Ohio are invited to apply. Click here for a link to the campus map. • Applications may be accessed by clicking here. singers, conductors, high school and college teachers and private voice teachers. submitted a week in advance, an accompanist will be provided at no expense to entrant. • Indicate any time conflict that should be considered when scheduling your audition time. • Arrive at least 30 minutes before your scheduled audition time. • Warm-up rooms will be available for limited use before auditions. 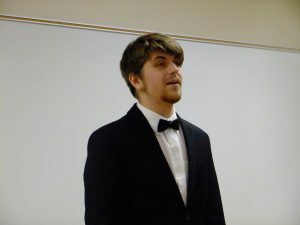 • Winners are expected to perform at the Tri-State College Vocal Competition on April 7, 2019. 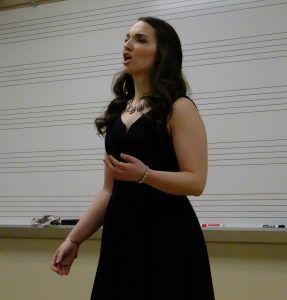 The Guild held its 2018 High School Vocal Competition in Sears Recital Hall on the University of Dayton campus on March 24, 2018. Over twenty outstanding area students sang with skill and emotion to display a varied repertoire of musical selections. Winning first place was soprano Lauren Maynus (left), a junior at Ursuline Academy in Cincinnati. 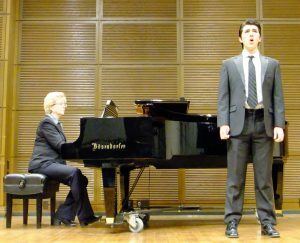 Baritone Reed Gnepper (center), a junior at the School for the Creative and Performing Arts in Cincinnati, earned the second place honors. Third place went to Alaya Hinesmon (right), a senior at Stivers School for the Arts in Dayton. 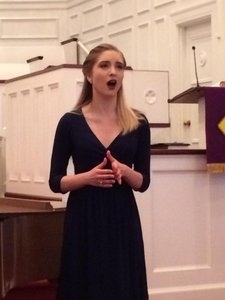 Honorable Mention was awarded to soprano Caroline Cruise, a senior from Olentangy Liberty High School in Columbus, and to baritone David Lewis, a junior at Stivers School for the Arts. The cash awards for this year’s Competition were once again funded by the generosity of the Norma J. Ross Youth Foundation. The Guild is grateful that this fund has supported the High School Vocal Competition for many years. Dr. David Sievers chaired this important Competition. 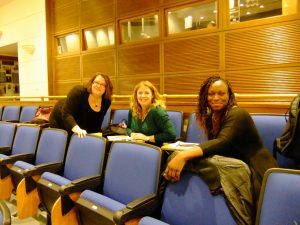 The judges include: Dr. Minnita Daniel-Cox (right), soprano and coordinator of the voice area at the University of Dayton; Dr. Andrea Chenoweth Wells (left), artist-in-residence at the University of Dayton; and Sarah Bucher (center), soprano and private voice teacher. Many Guild volunteers helped make the day so successful. They included Judy Hudson, Nora Stang, Kathy Brown, Patrick and Suzanne Crippen. Dr. Sievers elicited the assistance of several enthusiastic UD music students and accompanists. Thanks to them all. 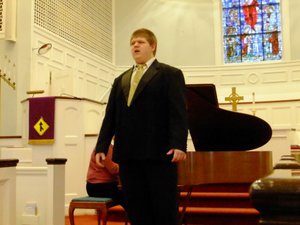 Opera Guild of Dayton held its annual High School Vocal Competition on March 18, 2017, at Fairmont Presbyterian Church. The Chair of the Competition, Dr. David Sievers from the University of Dayton, orchestrated the details for this special event. 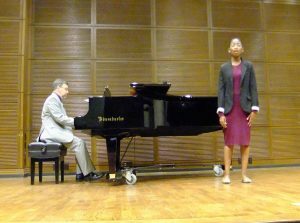 The judges for this year’s Competition were: Dr. Minnita Daniel-Cox from the University of Dayton, tenor Brian Skoog with Dayton Opera’s Artists-in-Residence and Alice Hotopp who is a private vocal coach. A big congratulations to all 20 singers who performed in the Competition. They all sang very well and did a great job; kudos to all of them! The First-Place ($600) winner was Anna Hlinomaz from Centerville High School. The Second-Place ($450) winner was Galen Adkins from Lebanon High School. The Third-Place ($300) winner was Destiny Donelson from Stivers School for the Arts. The Guild wishes to acknowledge the generosity of the Norma J. Ross Youth Foundation for its donation of the $1,350 which funded the awards. Norma’s Foundation has presented these award dollars for many years now. Our sincere thanks go out for their assistance. There were two Honorable Mention winners: Anna Greco from Lakota West High School and Sara Lavilla from Beavercreek High School. Thanks to a generous gift by Dr. Minnita Daniel-Cox, the Honorable Mention winners will each receive a full scholarship to attend the 2017 University of Dayton Vocal Performance Institute held in June. Congratulations again to all the winners! 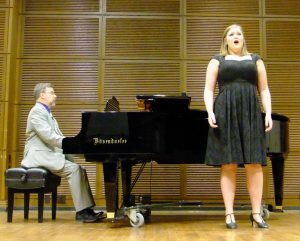 Come hear the first-, second-, and third-place winners sing on April 2 at the Opera Guild’s Tri-State College Vocal Competition at Kettering Seventh-Day Adventist Church. This Competition begins at 1:30 p.m. The Guild extends a huge Thank You to The Norma J. Ross Youth Foundation for sponsoring this Competition many times in recent years.